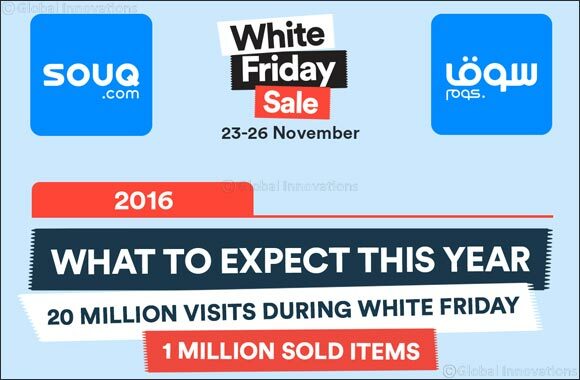 Dubai, UAE, November 22, 2016: The most awaited White Friday 2016, the biggest online sale in the Middle East by SOUQ.com starts tomorrow across the GCC and Egypt. SOUQ.com, the largest online and marketplace retailer in the region is offering incredible White Friday deals that will go live from the 23rd – 26th November on SOUQ.com as well as its mobile app. Unilever, Samsung, Mars, P&G, RB, PepsiCo, Hisense, Lenovo, Philips, Kenwood, Redbull, Johnson & Johnson, Henkel, One Plus, Xiaomi, Nivea, Nestle, Moulinex, Sun & Sand Sports, Futtaim Group, Apparel Group, Hokair Group, Landmark Group, Intel, Microsoft, and Redington.